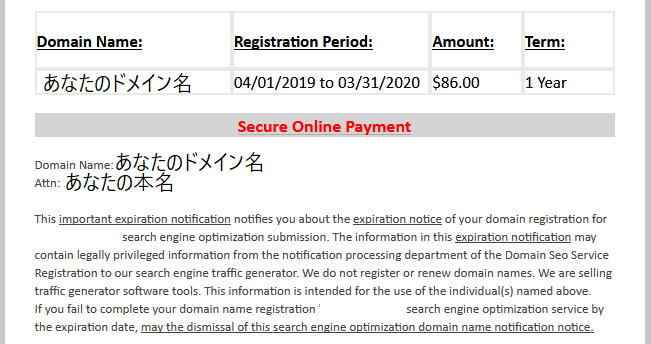 This important expiration notification notifies you about the expiration notice of your domain registration for 〇〇.com search engine optimization submission. The information in this expiration notification may contain legally privileged information from the notification processing department of the Domain Seo Service Registration to our search engine traffic generator. We do not register or renew domain names. We are selling traffic generator software tools. This information is intended for the use of the individual(s) named above. If you fail to complete your domain name registration 〇〇.com search engine optimization service by the expiration date, may the dismissal of this search engine optimization domain name notification notice. Failure to complete your seo domain name registration 〇〇.com search engine optimization service process may make it difficult for customers to find you on the web. This domain seo registration for 〇〇.com search engine service optimization notification will expire 03/18/2019. You have received this message because you elected to receive notification. If you no longer wish to receive our notifications, please unlike here. If you have multiple accounts with us, you must opt out for each one individually to unlike receiving notifications. We are a search engine optimization company. We do not directly register or renew domain names. You are dont need to pay the amount unless you accept this notification. This message, which contains promotional material strictly along the guidelines of the Can-Spam act of 2003. We have clearly mentioned the source mail-id of this email, also clearly mentioned our subject lines and they are in no way misleading.